The race is on for storage solutions that can help provide secure, reliable electricity supply as more renewables enter Australia’s electricity grid. 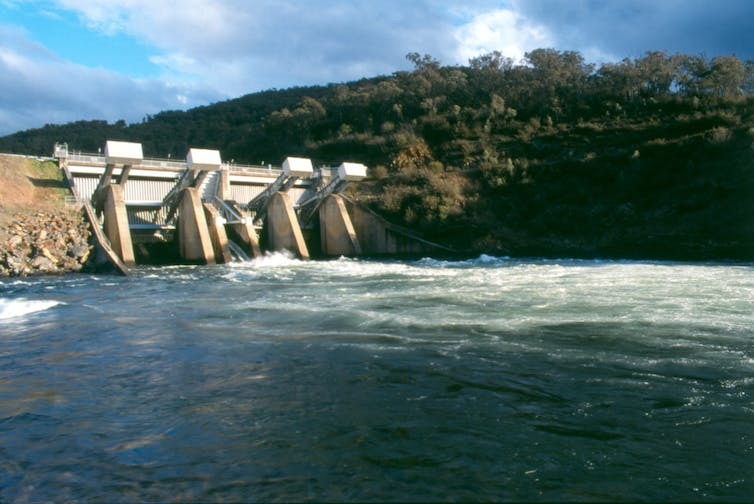 With the support of the Australian Renewable Energy Agency (ARENA), we have identified 22,000 potential pumped hydro energy storage (PHES) sites across all states and territories of Australia. PHES can readily be developed to balance the grid with any amount of solar and wind power, all the way up to 100%, as ageing coal-fired power stations close. 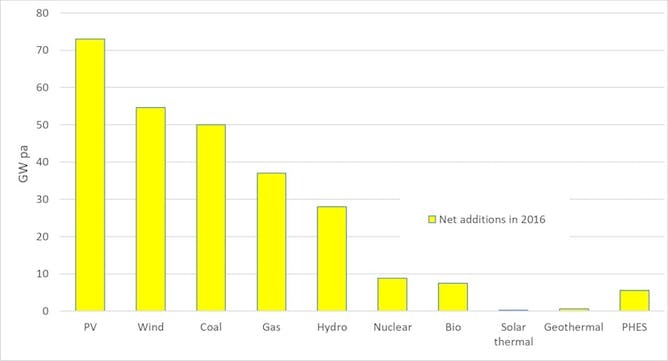 Solar photovoltaics (PV) and wind are now the leading two generation technologies in terms of new capacity installed worldwide each year, with coal in third spot (see below). PV and wind are likely to accelerate away from other generation technologies because of their lower cost, large economies of scale, low greenhouse emissions, and the vast availability of sunshine and wind. New generation capacity installed worldwide in 2016. Strong interconnection of the electricity grid between states using high-voltage power lines spanning long distances (in the case of the National Electricity Market, from North Queensland to South Australia). This allows wind and PV generation to access a wide range of weather, climate and demand patterns, greatly reducing the amount of storage needed. PHES accounts for 97% of energy storage worldwide because it is the cheapest form of large-scale energy storage, with an operational lifetime of 50 years or more. Most existing PHES systems require dams located in river valleys. However, off-river PHES has vast potential. Read more: How pushing water uphill can solve our renewable energy issues. Off-river PHES requires pairs of modestly sized reservoirs at different altitudes, typically with an area of 10 to 100 hectares. The reservoirs are joined by a pipe with a pump and turbine. Water is pumped uphill when electricity generation is plentiful; then, when generation tails off, electricity can be dispatched on demand by releasing the stored water downhill through the turbine. Off-river PHES typically delivers maximum power for between five and 25 hours, depending on the size of the reservoirs. 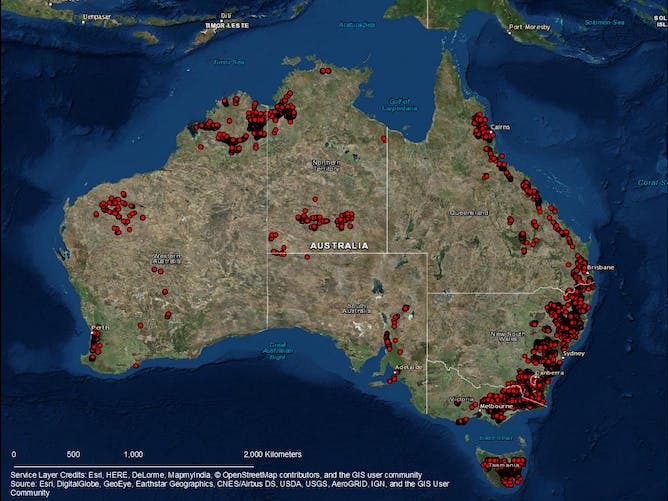 Most of the potential PHES sites we have identified in Australia are off-river. All 22,000 of them are outside national parks and urban areas. The locations of these sites are shown below. Each site has between 1 gigawatt-hour (GWh) and 300GWh of storage potential. 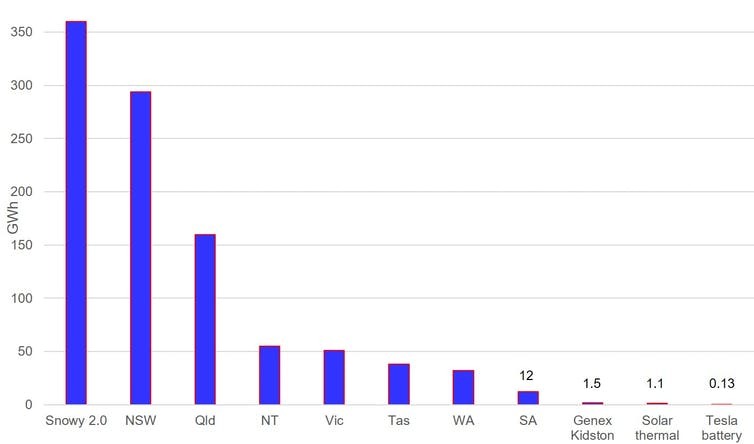 To put this in perspective, our earlier research showed that Australia needs just 450GWh of storage capacity (and 20GW of generation power) spread across a few dozen sites to support a 100% renewable electricity system. In other words, Australia has so many good sites for PHES that only the best 0.1% of them will be needed. Developers can afford to be choosy with this significant oversupply of sites. Pumped hydro sites in Australia. 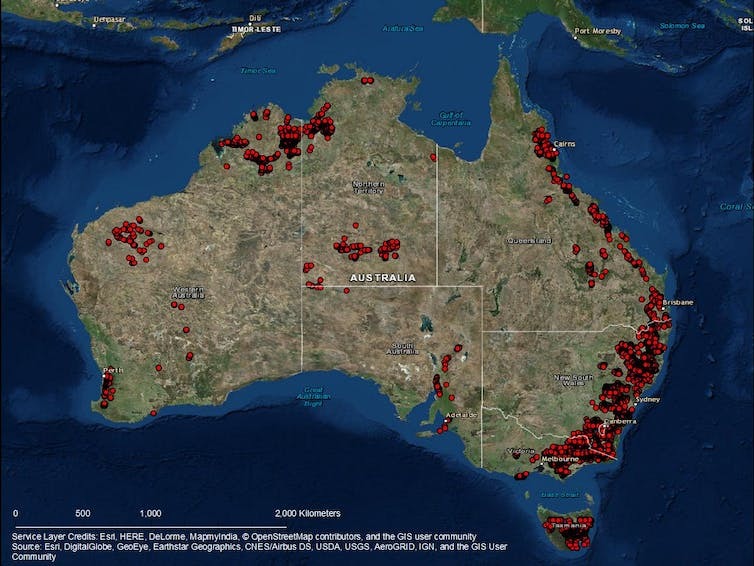 Western Australia: Concentrations of sites in the east Kimberley (around Lake Argyle), the Pilbara and the Southwest; some are near mining sites including Kalgoorlie. Fewer large hills than other states, and so the minimum height difference has been set at 200m rather than 300m. Northern Territory: Many sites about 300km south-southwest of Darwin; a few sites within 200km of Darwin; many good sites in the vicinity of Alice Springs. Minimum height difference also set at 200m. The maps below show synthetic Google Earth images for potential upper reservoirs in two site-rich regions (more details on the site search are available here). There are many similarly site-rich regions across Australia. 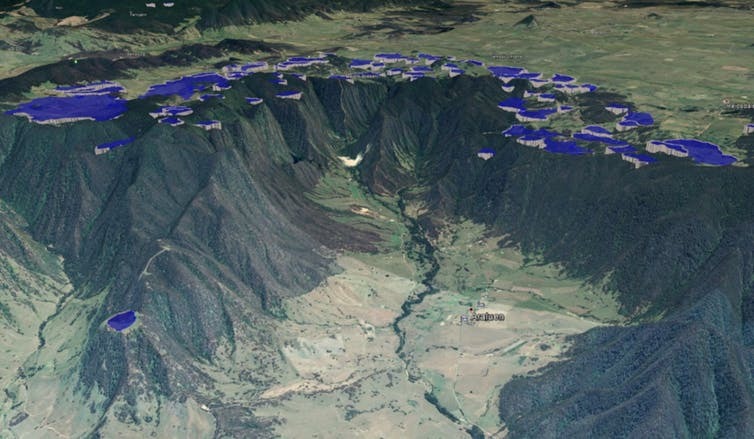 The larger reservoirs shown in each image are of such a scale that only about a dozen of similar size distributed across the populated regions of Australia would be required to stabilise a 100% renewable electricity system. Araluen Valley near Canberra. At most, one of the sites shown would be developed. Townsville, Queensland. At most, one of the sites shown would be developed. The chart below shows the largest identified off-river PHES site in each state in terms of energy storage potential. Also shown for comparison are the Tesla battery and the solar thermal systems to be installed in South Australia, and the proposed Snowy 2.0 system. Largest identified off-river PHES sites in each state, together with other storage systems for comparison. 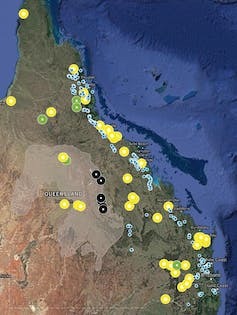 The map below shows the location of PHES sites in Queensland together with PV and wind farms currently in an advanced stage of development, as well as the location of the Galilee coal prospect. It is clear that developers of PV and wind farms will be able to find a PHES site close by if needed for grid balancing. 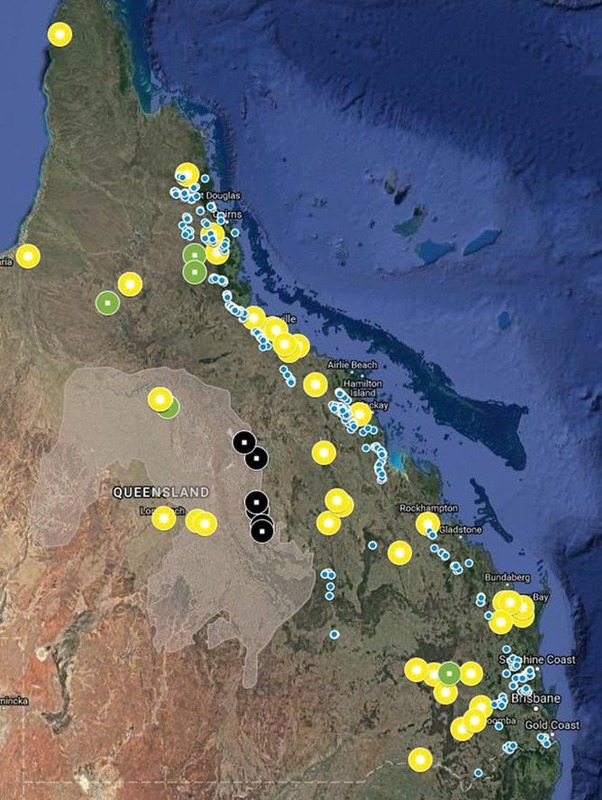 Solar PV (yellow) and wind (green) farms currently in an advanced stage of development in Queensland, together with the Galilee coal prospect (black) and potential PHES sites (blue). Annual water requirements of a PHES-supported 100% renewable electricity grid would be less than one-third that of the current fossil fuel system, because wind and PV do not require cooling water. 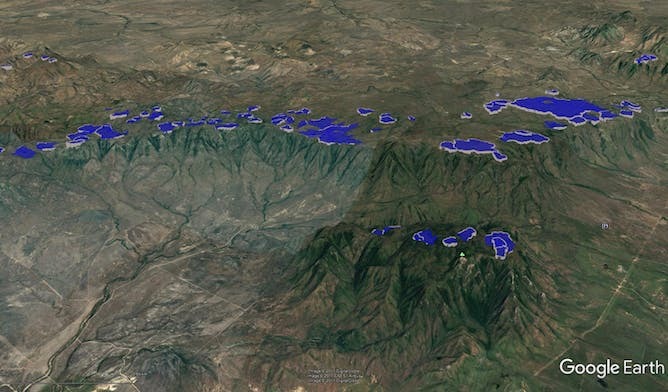 About 3,600ha of PHES reservoir is required to support a 100% renewable electricity grid for Australia, which is 0.0005% of Australia’s land area, and far smaller than the area of existing water storages. PHES, batteries and demand management are all likely to have prominent roles as the grid transitions to 50-100% renewable energy. Currently, about 3GW per year of wind and PV are being installed. If this continued until 2030 it would be enough to supply half of Australia’s electricity consumption. If this rate is doubled then Australia will reach 100% renewable electricity in about 2033. Fast-track development of a few excellent PHES sites can be completed in 2022 to balance the grid when Liddell and other coal-fired power stations close.